Here at baskerville we pride ourselves on the care and dedication that goes into every piece we make. We hand make each lamp from scratch in the workshop, not a factory in sight. We take incredible care in our craftsmanship and believe that what is handmade, is beautiful. We believe that when natural materials are showcased with minimal fuss, they shine the brightest. Influenced by the Scandinavian school of minimalism, we strive to maintain clean lines, elegant shapes and classic designs. Through following these principles, we strive to create timeless lamps. Furniture should do more than look good, it should be a pleasure to use. By embedding a piece of laser cut satinised brass seamlessly into our oak bases, we have developed a bespoke touch sensor switch, with four dimmable settings. This enables you to control the light with the tap of a finger, as well as adjust the level of light the lamp emits, tailoring the luminescence to your environment. Bamboo is one of Earth's most abundant natural resources, growing at up to 90cm a day. Through uniquely finishing this beautiful material, we are utilising a highly sustainable resource. We also ensure that all our oak is sourced from woodlands adhering to the regulations of the FSC (Forest Stewardship Council). After studying Philosophy and Physiology at the University of Oxford, Anton had a career in data analytics and brand consultancy. After delaying taking the plunge for long enough, he left the city to learn his trade in Hackney Wick, one of the industrial and creative centres of London's East End. 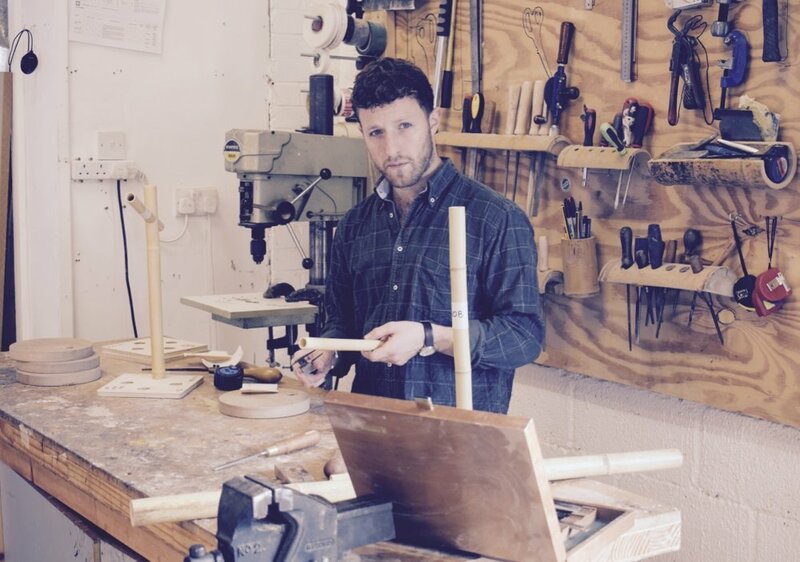 Embedded between traditional furniture makers and a studio specialising in the development of bamboo products, Anton was able to develop his lifelong passion for design and craftsmanship, ultimately leading to the birth of baskerville.